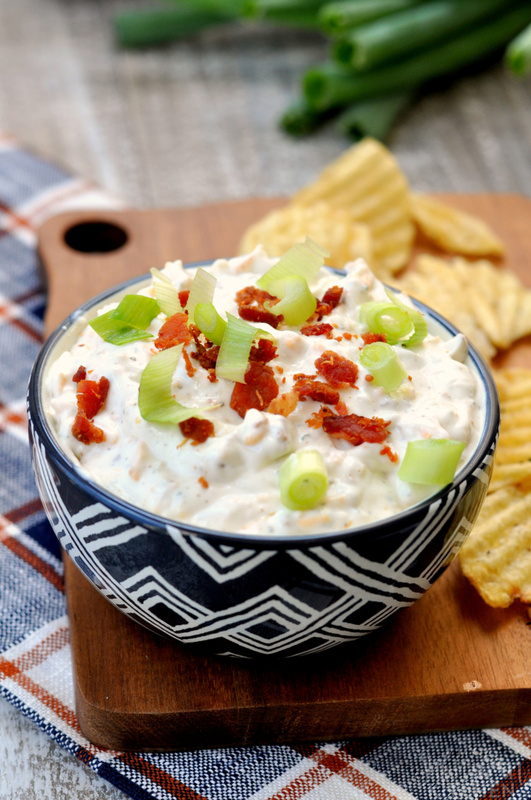 Loaded Fajita Dip is the perfect appetizer for your next tailgate or party! Simply grab some chips or vegetables and get dipping into this amazing dip filled with all the flavors of fajitas with almost none of the work. 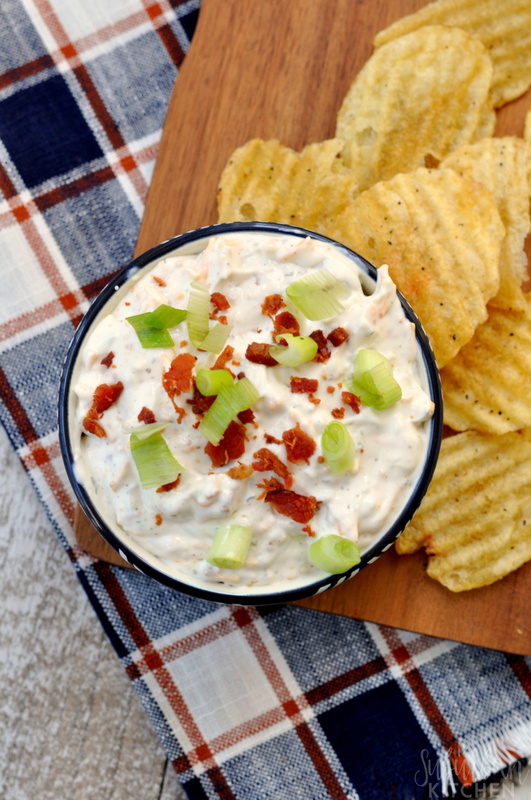 Every party needs a good dip (or two). I like ones that are simple to make but work perfectly with a variety of dipper options like this loaded fajita dip. Since this loaded fajita dip starts with a pre-made French onion dip, you can get it ready super fast. It is also perfect for a make and take dip because it lasts in the refrigerator for up to 2 days. Just be sure to add the bacon and green onions on top just before serving. If you make this loaded fajita dip or any other recipe from the blog, I’d love to hear about your experience. Let me know in the comments or snap a photo and tag it #MySuburbanKitchen on Instagram or Twitter. 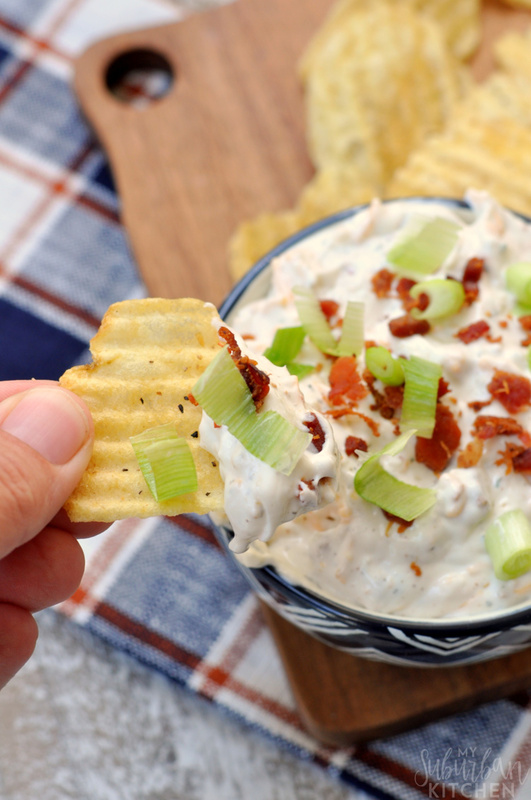 In a medium bowl, combine French onion dip, 3 slices of crumbled bacon, fajita seasoning, ranch dressing mix and shredded cheese. Stir well to combine. Cover and refrigerate for at least 30 minutes. Before serving, top with green onions and remaining crumbled bacon. Oh, this looks so yummy! I’m sure if I made it my husband would find a way to eat it all before I got any, he loves dip. Thanks for joining the Family Joy Link Party! Your sweet Luna is adorable and I can’t wait to try your dip recipe. Congrats, you’re featured this week at the #ThisIsHowWeRoll Link Party.